Concerned citizens, two state agencies, a county and a team of “turtle wranglers” are joining forces to help rare and common turtles cross the road more safely at a Portage County site identified as one of Wisconsin’s most dangerous crossings for turtles and other wildlife. State Highway 66 is to be resurfaced this summer and thanks to the partners, the project will involve measures to allow turtles to safely cross from a wetland on the north side of the highway to the south side where they lay their eggs along a sandy berm. “The Jordan Pond project is a great example of local citizens identifying problem crossings and working with state and local partners to make those crossings safer for turtles, other wildlife, and motorists,” says Andrew Badje, a conservation biologist who coordinates the Wisconsin Turtle Conservation Program for the Wisconsin Department of Natural Resources. 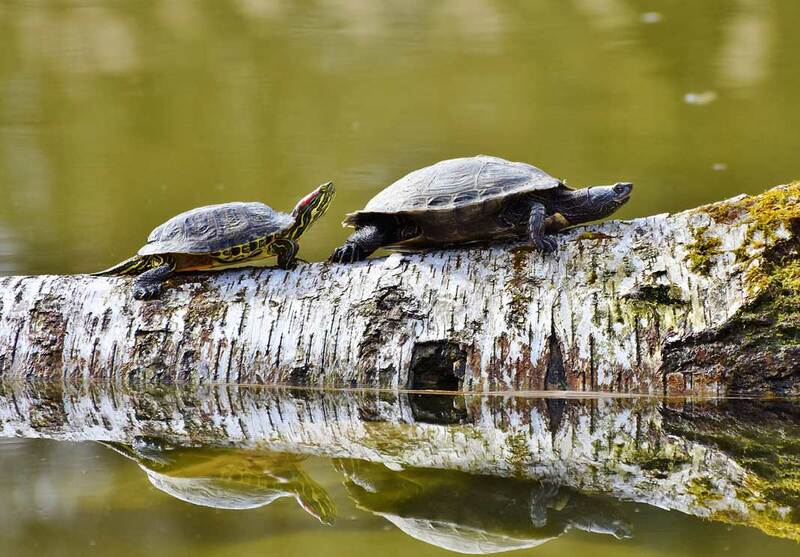 Concerned citizens submitted information about turtles crossing the stretch of highway along Jordan Pond and also seeing turtle carcasses on the road to the DNR’s Wisconsin Turtle Conservation Program. Their information was incorporated into a database that maps road crossings that are a particular problem for turtles and other wildlife. This information has helped spur road crossing signage, fencing and other measures to reduce turtle mortality at these sites. DNR staff reviewing the plan to resurface the road brought the citizen information, along with previous University of Wisconsin-Stevens Point research and data from Wisconsin’s Natural Heritage Inventory database to the attention of Tom Peronto, the Department of Transportation design project leader. Peronto knew the site was a problem for wildlife and potentially motorists from seeing it firsthand after seeing nine to 10 turtle carcasses along the road. In addition a local resident told him motorists would sometimes stop their cars, get out and help turtles crossing the road, creating a potential traffic safety problem. The WisDOT design team worked with Portage County and a UW-Stevens Point professor and his student “turtle wranglers” to identify where turtles were crossing the road. In 2015, the turtle wranglers trapped turtles, documenting that four species occur in the project area, including both rare and common species. They also patrolled the area looking for turtle carcasses and collected 66 turtle carcasses along the quarter-mile stretch of road. The WisDOT design team used that information to incorporate turtle crossing safety measures into the roadway project, which will include installing fencing and a culvert in the existing roadway embankment and minimizing wetland impacts. Student turtle wranglers will continue monitoring the site this year during road construction and next year to see how well the roadway improvements are working. “Once the fencing and culvert passage is installed, we expect that mortality will be reduced for all amphibians, reptiles, and small animals through this stretch of improved highway as it meanders through the environmentally sensitive area,” Badje says. WisDOT expects the project will improve motorist safety as well by reducing or eliminating people slowing their cars for turtles or getting out of their cars to help turtles cross. All Wisconsin turtles lay their eggs in nests in uplands and female turtles getting run over while trying to cross to nesting areas is considered one of the leading causes of declining turtle numbers in Wisconsin.